Mediterranean chameleon Chaemaeleo chamaeleon, copyright Benny Trapp. For my next post, I drew the topic of 'Chamaeleonidae', the chameleons*. 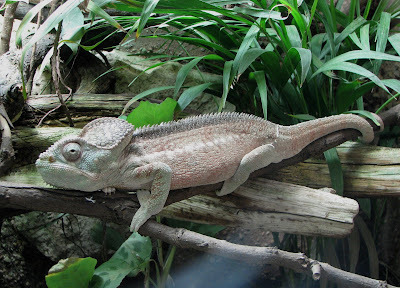 This left me with a bit of a quandary because Darren Naish over at Tetrapod Zoology covered the chameleons recently in his usual exhaustive style in a series of three posts (part 1, part 2, part 3). 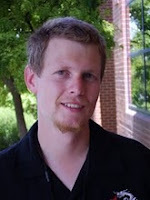 I was somewhat tempted to simply tell you all to go read Darren's posts and consider my work done, but let's see if I can dig up anything he left out. You should still go read Darren's posts anyway. *I'm using Chamaeleonidae in the restricted sense here, the one that will probably be familiar to most people. Some authors have suggested expanding Chamaeleonidae to also include members of the dragon family Agamidae, following the recognition that the latter in its traditional sense is paraphyletic. This suggested re-classification does not appear to have caught on widely. Chameleons are certainly one of the most distinctive of lizard groups, with their clasping zygodactylous foot structure, periscopic eyes and projectile tongues. They are most diverse in Africa, with only the genus Chamaeleo extending into southern Europe (just barely) and south-western Asia to India. The name is Greek in origin and can be read as 'ground lion'; presumably someone thought that the European chameleon's hissing threat display looked a bit like an imitation of a lion's roar. The most familiar chameleons are primarily arboreal, creeping slowly along branches, but the smaller leaf chameleons are terrestrial and this may represent the ancestral habit for the family (Tolley et al. 2013). 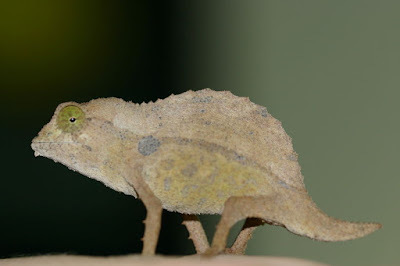 The tiny leaf chameleons, some of which are less than two centimetres long when mature, have a morphotype that is best described as 'completely daft'. This is a bearded leaf chameleon Rieppeleon brevicaudatus, copyright Fridtjof Busse. Chameleons are most famous, of course, for their colour-changing abilities. Most of you will probably be aware that said colour changes are related to social signalling rather than camouflage... except that, in a sense, they are related to camouflage too, because a chameleon that drops its signal colours becomes a lot better concealed. The colour is managed through guanine crystals in the integument: changing the distance between crystals changes the wavelength reflectance of the light. The degree to which chameleons change colour varies from species to species. Some merely change their overall shade from darker to lighter (which I suspect may be related to body temperature regulation as much as anything else) whereas others reveal bright lurid patterns of flouro stripes and blotches. I haven't come across any indications whether there are any chameleon species that don't change colour at all, nor do I know what the distribution of colour-changing is like in other lizard groups. I do have a vague memory that thorny devils Moloch horridus (belonging to the related Agamidae) become duller in colour when they are colder, but I'm not certain about this. And I'm going to cite one recent paper on colour signalling in chameleons by Ligon (2014) purely for its epic title: "Defeated chameleons darken dynamically during dyadic disputes to decrease danger from dominants". Male Malagasy giant chameleon Furcifer oustaleti, copyright Drägüs. Because of their Africa-centric distribution, chameleons have generally been assumed to have originated on that continent. The fossil record of chameleons is pretty abysmal (probably because they tend not to frequent habitats conducive to fossilisation) though Miocene fossils do indicate a wider distribution in Europe during warmer times. 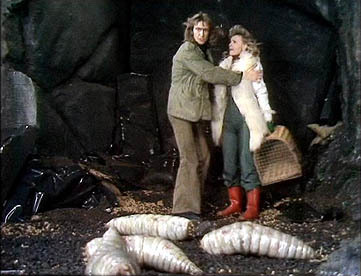 The European fossil species are included in the genus Chamaeleo, though I'm not sure if this indicates a close relationship with the modern European species or is simply an artefact of when most larger chameleons were included in this genus. The eastern islands of Africa are home to three independent clades of chameleons: the leaf chameleons Brookesia and a clade of larger chameleons containing the genera Furcifer and Calumma in Madagascar, and the Seychelles endemic Archaius tigris. Though Brookesia represents the sister clade to the remaining chameleons, current directions make it likely that each of these clades represents a dispersal from African ancestors* (it is unlikely that chameleons are old enough for the clades to have been separated by plate tectonics). One announcement that was recent enough to have missed Darren Naish's posts (though it made it into the ensuing comments) was the discovery of a close relative of the chameleons preserved in Burmese amber from the Cretaceous period. This specimen (which has not yet been given a scientific name beyond the collection number of JZC Bu154) is, at less than 11 mm long, probably a very young juvenile, though even when adult it may have only been in the size range of the tiny Brookesia leaf chameleons. JZC Bu154 retains a number of ancestral features relative to modern chameleons, such as a non-clasping foot structure, so if it is related to the chamaeleonids it is undoubtedly in the stem group (Daza et al. 2016). As such, its Burmese provenance does not contradict an African origin for crown-group chameleons. 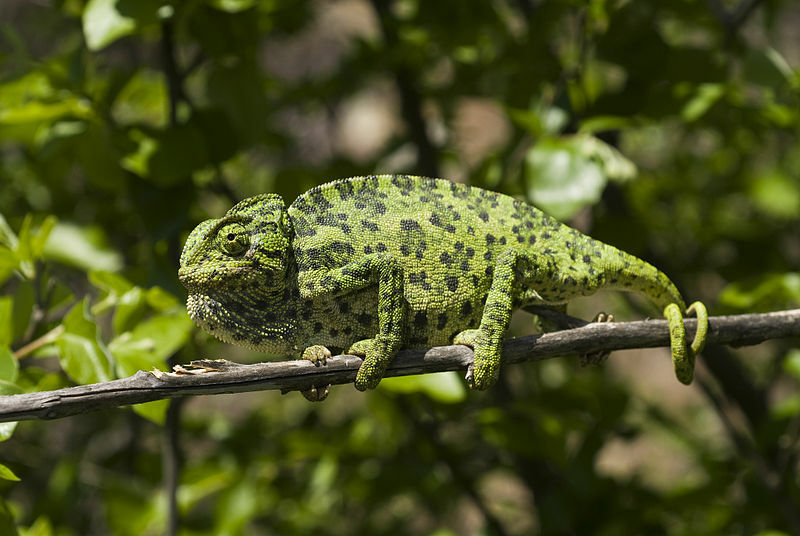 *At least one chameleon has dispersed in the opposite direction by other means: thanks to human transportation, the Malagasy giant chameleon Furcifer oustaleti established a small population in the vicinity of Nairobi, though it appears doubtful whether this still survives. Two other species, the veiled chameleon Chamaeleo calyptratus and Jackson's chameleon Trioceros jacksonii, native to the Arabian Peninsula and east Africa, respectively, have been introduced to some parts of the United States, most notably Hawaii. Daza, J. D., E. L. Stanley, P. Wagner, A. M. Bauer, & D. A. Grimaldi. 2016. Mid-Cretaceous amber fossils illuminate the past diversity of tropical lizards. Science Advances 2: e1501080. Tolley, K. A., T. M. Townsend & M. Vences. 2013 Large-scale phylogeny of chameleons suggests African origins and Eocene diversification. Proceedings of the Royal Society B 280: 20130184. Bearded dragons (Pogona sp.) are also capable of changing their overall color between lighter and darker in response to temperature and, sometimes, mood. So, I wonder if color changing is a more widespread trait in the Agamidae? Could well be. Indeed, I was wondering while writing this post if colour-changing had first evolved in relation to temperature regulation (some animals seem to change colour in relation to temperature as much as a simple side-effect of their integument chemistry as any practical reason) and was later co-opted for more complex applications. There are other agamids with remarkable colour-changing abilities - such as Calotes versicolor, "changeable lizard", with a huge range in Asia. There are non-agamids as well. Green Anoles can also change colour. So far they are all suborder Iguania but fast colour-changing geckos are described in ES Ruth, RB Gibson "The disappearance of the pigment in the melanophore of Philippine house lizards" The Philippine Journal of Science (1917) B12: 181-189 (found at biodiversity.org, a great resource for free old papers). These appear to now be called Hemidactylus platyurus, H. frenatus, H. luzonensis (= H. brookii?) and Gehyra mutilata. Perhaps people notice that lizards change colour the more the lizard is around humans, as house geckos are very familiar. Thanks, Pat. I knew about anoles, of course, but as they're not so close to chameleons phylogenetically I had no idea what the chance was that their colour-changing abilities were homologous.